Get the novel World War Z or the audiobook cheaply from Amazon. You too can earn money from writing articles by signing up for InfoBarrel. From Max Brooks, the author of The Zombie Survival Guide, comes a novel describing a worldwide zombie outbreak and the efforts to defeat it, World War Z. This is set barely a decade after the official end of the zombie conflict in the last major power, the book is a retrospective look at the events of what is commonly referred to as World War Z, the zombie war. In the introduction to the novel the author states that, as a researcher for the United Nations Postwar Commission Report, he gathered lots of stories from many different survivors from all over the globe, many of which were rejected from the official report for being too human oriented, and not the simple facts and figures they were looking for. Following an argument with his boss, who suggested this as a use for the information he had collected that wasn't used, he decided to gather them all into a book, with the stories being told in retrospect after the Zombie War was finally ended. This does create the rather unusual circumstance that, because the stories are told after the war, the reader knows that the people narrating their stories survived what happened. The introductions to the various individual stories provide background to each, and also reveal information and give background to how the world changed following the war, such as referring to Lhasa, Tibet, as the world's most populous city after the war. The city currently has a population of over half a million which, even though bigger than many cities, is still nowhere near the population of the largest cities in the world. For it to become the world's most populous city would require an enormous dieback, giving an idea as to how many people were killed. Other such sections show how world power has shifted, with new nations rising to the top. Credit: Duckworth OverlookThe book is divided into chapters which are based on stages of the war starting with the initial, mostly ignored, reports that few believed, through each stage of the war as the zombie infection spread and how humanity started to fight back, concluding with the aftermath of the war. Each chapter is divided into a number of personal stories, which are individual people's experiences related to the topic of the chapter as a whole. Each chapter is therefore comprised of the viewpoints of a number of different people; sometimes as interviews, sometimes as narrative interrupted with questions and sometimes straight monologues. Few of the people in the book appear more than once, except in the last chapter where some are revisited. The majority of the book is made of personal accounts, which are effectively speeches or conversations with the occasional factual reference thrown in, often descrbing what the person "speaking" is doing at the time, giving emotional context that would otherwise be missed out. 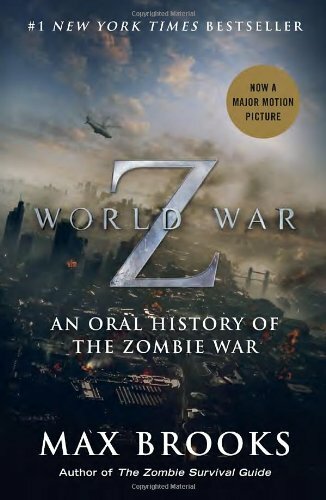 World War Z: An Oral History of the Zombie War is a rather different take on the whole zombie apocalypse genre. For one thing, it tells the entire story of the apocalypse, rather than just a small part, or parts, of it, and for another it has a very large cast of characters, rather than just a few who are followed for the duration of the story. Some parts of the book are, through the narratives, critical of how some people and governments behaved during the war, especially those who, even after it's been proven that what they did was wrong, ill conceived or simply dishonest, still defend their position as being the right thing to do. The novel was recently made into a film of the same name starring Brad Pitt. Those who have seen the film will find that the book is completely different from the movie, as the latter focused on only one character, that of Brad Pitt's character Gerry Lane, who did not appear in the book at all. The novel has a plenitude of characters spread across many different countries, but only one character in the book appears to have definitely made it into the film, the Israeli Jurgen Warmbrunn. The book also covers a much greater span of time as it covers the whole conflict from start to finish. The zombies in the book are traditional zombies - slow moving and flesh-eating - rather than the film's "turbo" zombies. Given the wide range of characters, this is one novel that might have been better as a series, rather than a film. 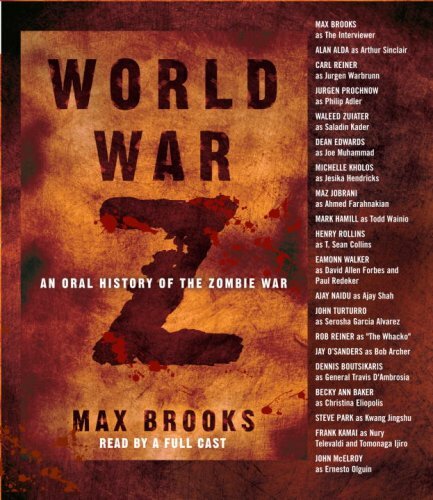 Overall, World War Z is well worth a read (or listen, as it is also available as an audiobook) and, despite the fact that no single character appears for more than a few pages of the book, is a strangely captivating story.